Exclusive interview with Bambang Brodjonegoro, Minister of National Development Planning. Indonesia’s four richest people own as much wealth as its poorest 100 million citizens, while its poorest 10% live on as little as 76 cents a day, the Central Bureau of Statistics reported in March 2018. “I think we have a big opportunity to reduce the poverty, to reduce inequality,” Bambang Brodjonegoro, Minister of National Development Planning tells GovInsider. OECD data shows that it has been among the fastest growing economies in the G20 nations, just after China and India, but the benefits of this growing income have clearly not been distributed across the country. To try to address this rising problem, President Joko Widodo has issued policy mandates to fight corruption and inequality in the country. In an exclusive interview, the Minister discusses how Indonesia is turning to data and tech to cut corruption and improve food security; and find new sources of growth. The Minister is on the sidelines at the regional Open Government Partnership summit, joining GovInsider for breakfast before politicians from across Asia Pacific discuss to how to “empower citizens to shape government so it serves them not itself”. The Girl from Ipanema wafts across a plush hotel coffee lounge, with business cards exchanged and ministers mingling amongst themselves. Anti-corruption efforts are often defined by this quiet grind of commitments and engagement, rather than fiery rallies and populist revolutions. Brodjonegoro is an old hand at these events, having hosted the previous powwow in Jakarta last year. Indonesia has transformed over the past twenty years from a military dictatorship to a robust democracy with a burgeoning civil society. But it is still plagued by corruption which prevents funds and services going to those most in need. Bribery and favouritism in procurement costs the government up to US$4 billion per year, according to a study by the Foreign Corrupt Practices Act (FCPA) blog. The current administration wants to tackle corruption using e-procurement to track where money is going, whether prices paid are reasonable, and whether projects have ultimately been delivered on time and on budget. “Sometimes, it’s less transparent; people are questioning why this company wins, while the other does not,” the Minister notes. The platforms will create greater competition by allowing suppliers to see the prices offered by their competitors. “They can understand with this electronic procurement catalogue, whether their product is highly competitive or not, because they can see the price of exactly the same stuff from other companies,” he said. At present, tendering in government is different across each ministry, with no single accountable figure or procurement specialist. Therefore, the government is introducing special task forces to oversee procurement projects at the provincial, municipal, and district-level governments. A “dedicated efficient unit dealing with procurement”, he says, will shift the country “from limited or closed procurement into more open and more electronic procurement”. At the national level, the government wants each ministry to have its own procurement department. Companies now need to put in formal paperwork for bids and tenders with local procurement units. E-procurement can help local governments gain better deals from suppliers and reduce wasted funds, creating “budget savings”, says Brodjonegoro. “You can reallocate the excess amount for other priorities, rather than just doing the routine things,” he notes. While the disclosure of governments budgets online “might not be 100% open yet”, it is crucial that “the movement towards the full disclosure of the budgeting is there”, he adds. 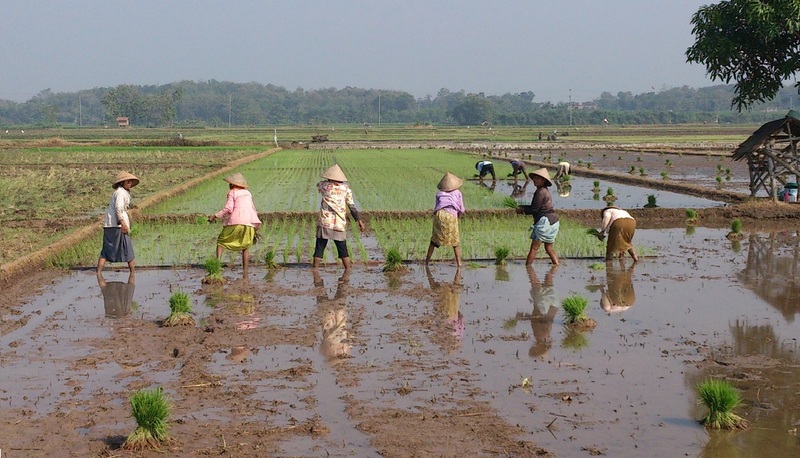 The Central Bureau of Statistics is now building a national rice data system that will accurately monitor rice production across the country, Indonesian media reported. The system will borrow from satellite imagery captured by its aeronautics agency, and from ground-level checks by agrarian officials to estimate rice production amounts in the country. The data system will be run by the Central Bureau of Statistics, Technology Development and Assessment Agency, the National Institute of Aeronautics and Space, the Geospatial Information Agency, and the Ministry of Agrarian and Spatial Planning. The President set a target to achieve 7% GDP growth per year when he was elected in 2014, but 5.3% growth is the “maximum that we can get”, Brodjonegoro admits. “We cannot get to 7%, is because we don’t have enough economic transformation, or economic reform,” the Minister notes. “We have to reduce our dependence on natural resources, commodities,” he adds. Indonesia is now building up more services to boost its economy. “We are focusing on tourism, plus the creative economy,” the Minister says. For one, the country is now working with tech companies to create digital tourism platforms that will help boost tourism rates. “I think the biggest opportunity is that we still have plenty of room to grow and develop,” Brodjonegoro adds. In recent years, China has fast become one of Indonesia’s largest investors. But China’s debt financing projects puts Indonesia at risk of falling into a “debt trap”, where countries are not able to repay the money they borrow, he warns. This is something Indonesia is keen to avoid, says the Minister. “We welcome equity financing but we will be very cautious with debt financing,” Brodjonegoro says. Other Asian countries, like Malaysia and Sri Lanka, have fallen into such debt traps. Sri Lanka owes over $8 billion to Chinese state firms, and recently relinquished control of a strategic port to China on a 99-year lease, the New York Times reported. Malaysia’s debt now amounts to US$251 billion, the country’s Finance Minister announced in May. New Prime Minister Mahathir Mohamad cancelled US$22 million worth of Chinese-backed projects until the country can find a way out of its debt. The reason he gave was that Malaysia was “borrowing too much money, which we cannot afford, we cannot repay, and also because we don’t need those projects for Malaysia at this moment… Our problem now is how to solve our financial deficit”. Indonesia still has a lot of untapped potential: it is home to one of the world’s fastest growing and largest youth populations. Minister Bambang believes that tech-driven policies can help the country to cut corruption, lower poverty rates and drive its economic growth to new heights.